Three American Presidents have failed with the only plan for peace on the table – the Two State Solution. Instead of banging heads together to try to make something impossible work, let us opt for things which have worked in the past. The territory on the East Bank of the River Jordan, now known as Jordan and the land on the West Bank of the Jordan, were one territory, known as Palestine before 1917 and was ruled from Damascus as part of the Ottoman (Turkish) Empire. Jordan and Israel have a great deal in common . They have a common border: the Jordan. They have a common problem – the Palestinians. Neither of them has oil or any other great mineral resources. They share the Dead Sea and have reached an agreement after many years of discussion to build a pipeline from the Red Sea to the Dead Sea, as the Dead Sea is rapidly disappearing from lack of water. Let us build on that agreement to create a peace plan to solve the Palestinian refugee problem. What should be added is a combination of three past successes — the Panama Canal Zone, Hong Kong and Singapore – and combine them into one overall plan. 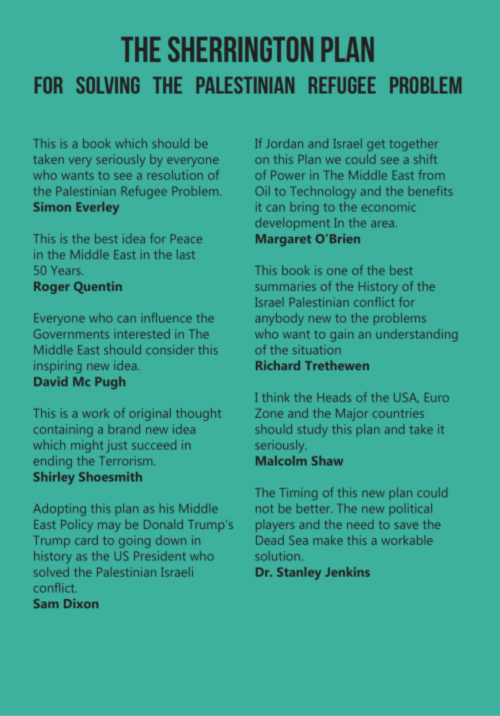 This book sets out to show why this would work and how it can be implemented. It is not a quick fix. The problem has been around for the last 70 years, so if it takes a few years to solve it; that is not important. What is important is that it has a chance of not only working, but bringing a lasting peace. This book is in two parts. The first part gives the reasons why the existing plan: the Two State Solution will never work. 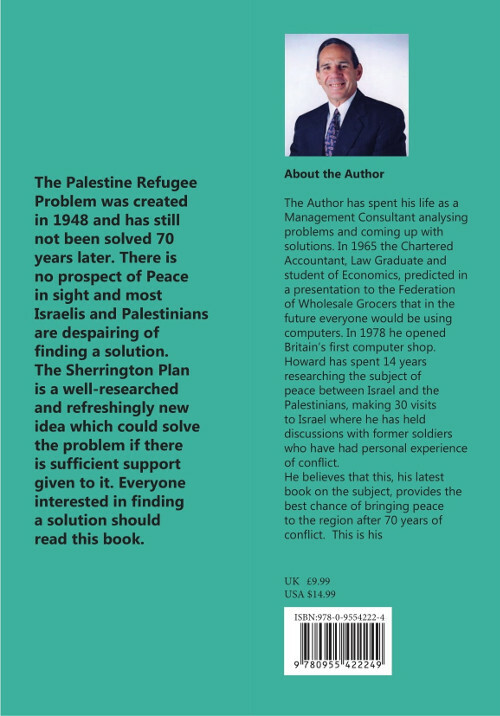 The second part deals with a completely new solution which for want of a better title is called The Sherrington Plan.